They patted it with their little soft paws —"Shall we make dear little muffins?" said Mittens to Moppet. But just at that moment somebody knocked at the front door, and Moppet jumped into the flour barrel in a fright. Mrs. Tabitha came downstairs mewing dreadfully—"Come in, Cousin Ribby, come in, and sit ye down! I'm in sad trouble, Cousin Ribby," said Tabitha, shedding tears. "I've lost my dear son Thomas; I'm afraid the rats have got him." She wiped her eyes with an apron. "I'm not afraid of rats; I will help you to find him; and whip him too! What is all that soot in the fender?" "The chimney wants sweeping—Oh, dear me, Cousin Ribby—now Moppet and Mittens are gone!" "They have both got out of the cup- board!" Ribby and Tabitha set to work to search the house thoroughly again. They poked under the beds with Ribby's umbrella, and they rummaged in cupboards. They even fetched a candle, and looked inside a clothes chest in one of the attics. They could not find anything, but once they heard a door bang and somebody scuttered downstairs. "Yes, it is infested with rats," said Tabitha tearfully, "I caught seven young ones out of one hole in the back kitchen, and we had them for dinner last Saturday. And once I saw the old father rat—an enormous old rat, Cousin Ribby. I was just going to jump upon him, when he showed his yellow teeth at me and whisked down the hole." "The rats get upon my nerves, Cousin Ribby," said Tabitha. Ribby and Tabitha searched and searched. They both heard a curious roly-poly noise under the attic floor. But there was nothing to be seen. The first thing they found was Mittens, hiding in an empty jar. They tipped up the jar, and she scrambled out. "Oh! Mother, Mother, there has been an old man rat in the dairy—a dreadful 'normous big rat, Mother; and he's stolen a pat of butter and the rolling-pin." "A rolling-pin and butter! Oh, my poor son Thomas!" exclaimed Tabitha, wringing her paws. "A rolling-pin?" said Ribby. "Did we not hear a roly-poly noise in the attic when we were looking into that chest?" The fire had only just been lighted, and it was not hot; but there was a white choky smoke from the green sticks. Tom Kitten got upon the fender and looked up. It was a big old-fashioned fireplace. The chimney itself was wide enough inside for a man to stand up and walk about. So there was plenty of room for a little Tom Cat. He jumped right up into the fireplace, balancing himself upon the iron bar where the kettle hangs. The chimney was a very big old-fashioned one. It was built in the days when people burnt logs of wood upon the hearth. Tom Kitten was getting very frightened! He climbed up, and up, and up. Then he waded sideways through inches of soot. He was like a little sweep himself. It was most confusing in the dark. One flue seemed to lead into another. There was less smoke, but Tom Kitten felt quite lost. "This seems funny," said Tom Kitten. "Who has been gnawing bones up here in the chimney? I wish I had never come! And what a funny smell! It is something like mouse; only dreadfully strong. It makes me sneeze," said Tom Kitten. He groped his way carefully for several yards; he was at the back of the skirting- board in the attic, where there is a little mark * in the picture. When Tom Kitten picked himself up and looked about him—he found himself in a place that he had never seen before, although he had lived all his life in the house. "Please sir, the chimney wants sweeping," said poor Tom Kitten. All in a minute she rushed upon Tom Kitten, and before he knew what was happening— His coat was pulled off, and he was rolled up in a bundle, and tied with string in very hard knots. 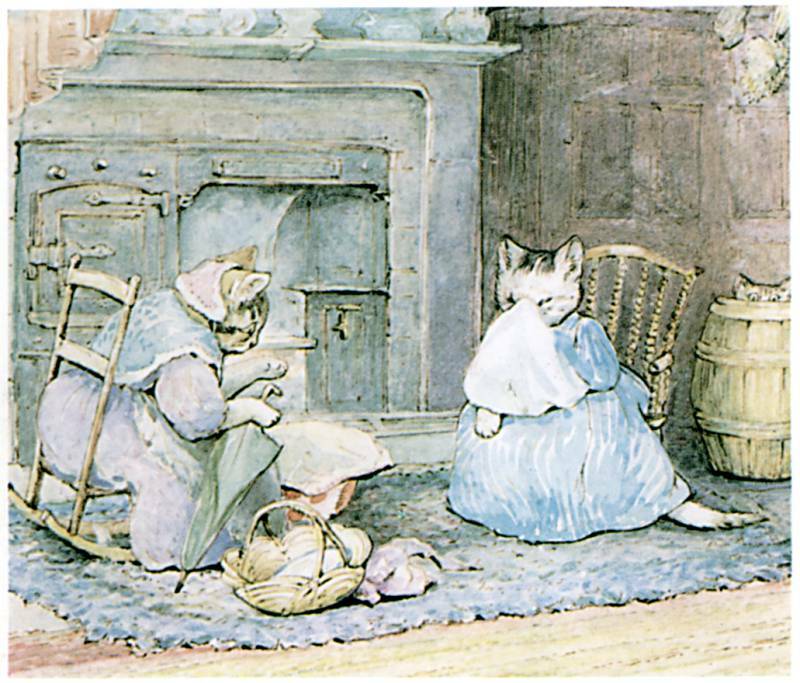 "Anna Maria," said the old man rat (whose name was Samuel Whiskers),— "Anna Maria, make me a kitten dumpling roly-poly pudding for my dinner." "It requires dough and a pat of butter, and a rolling-pin," said Anna Maria, considering Tom Kitten with her head on one side. "Nonsense! Butter and dough," replied Anna Maria. The two rats consulted together for a few minutes and then went away. Samuel Whiskers got through a hole in the wainscot, and went boldly down the front staircase to the dairy to get the butter. He did not meet anybody. He made a second journey for the rolling- pin. He pushed it in front of him with his paws, like a brewer's man trundling a barrel. He could hear Ribby and Tabitha talking, but they were busy lighting the candle to look into the chest. Anna Maria went down by way of the skirting-board and a window shutter to the kitchen to steal the dough. She borrowed a small saucer, and scooped up the dough with her paws. Except a spider, which came out of a crack in the ceiling and examined the knots critically, from a safe distance. It was a judge of knots because it had a habit of tying up unfortunate blue-bottles. It did not offer to assist him. "Will not the string be very indigestible, Anna Maria?" inquired Samuel Whiskers. Anna Maria said she thought that it was of no consequence; but she wished that Tom Kitten would hold his head still, as it disarranged the pastry. She laid hold of his ears. "I do not think"—said Samuel Whiskers, pausing to take a look at Tom Kitten—"I do NOT think it will be a good pudding. It smells sooty." Anna Maria was about to argue the point, when all at once there began to be other sounds up above—the rasping noise of a saw; and the noise of a little dog, scratching and yelping! "We are discovered and interrupted, Anna Maria; let us collect our property,— and other people's,—and depart at once." "I fear that we shall be obliged to leave this pudding." So it happened that by the time John Joiner had got the plank up—there was nobody under the floor except the rolling-pin and Tom Kitten in a very dirty dumpling! Then he nailed the plank down again, and put his tools in his bag, and came downstairs. The cat family had quite recovered. They invited him to stay to dinner. John Joiner smelt the pudding; but he regretted that he had not time to stay to dinner, because he had just finished making a wheel-barrow for Miss Potter, and she had ordered two hen-coops. And when I was going to the post late in the afternoon—I looked up the lane from the corner, and I saw Mr. Samuel Whiskers and his wife on the run, with big bundles on a little wheel-barrow, which looked very like mine. They went into the barn, and hauled their parcels with a bit of string to the top of the haymow. And they are all descended from Mr. and Mrs. Samuel Whiskers—children and grand-children and great great grand-children. They go out rat-catching in the village, and they find plenty of employment. They charge so much a dozen, and earn their living very comfortably. They hang up the rats' tails in a row or the barn door, to show how many they have caught—dozens and dozens of them. Add The Tale of Samuel Whiskers to your own personal library.